Avian Migrate™ is a goose and bird repellent used to keep unwanted geese and pest birds off of your property. This product is EPA-registered and will work on all types of birds. Avian Enterprises, LLC introduces Avian Migrate™, the most effective and easy to use liquid bird repellent that stops geese and other birds from congregating at airports, golf courses, parks, athletic fields, common areas and public buildings. The effects are immediate and long lasting. Avian Migrate™ irritates the bird’s pain center and teaches them to avoid treated areas. This EPA-registered product is non-toxic, not harmful to geese and biodegradable. 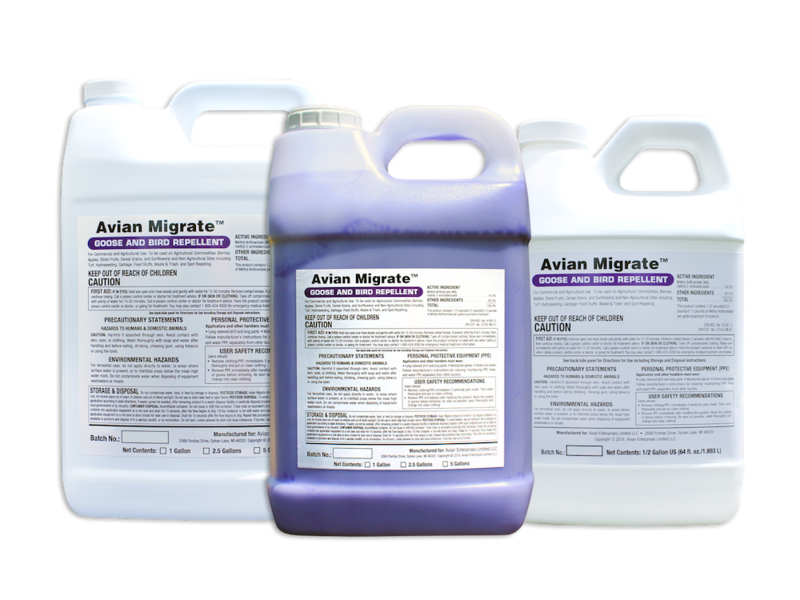 Each application of Avian Migrate™ is effective for up to two weeks. Avian Migrate™ is available in one-half gallon jugs, one gallon jugs and 2.5 gallon jugs. It may be easily applied with all common types of spraying equipment. For more information, contact Jon Stone at 888.366.0709 or email, sales(at)aviancontrol(dot)com, or visit http://www.aviancontrol.com to learn more.